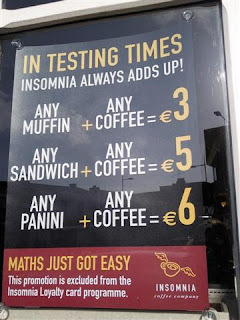 I was passing Insomnia Coffee in Rathmines the other day when I noticed the above sign in their window. The food deals look like good value, especially with the 'any coffee', but what caught my eye was the small print underneath. Personally I don't like that. They should continue to show a bit of loyalty to the customers that support them.